I live in Maine, or the Northeast. I leave my orchids out side from April/May until Sept/Oct. 50's and 60's at night is ok. Mine stay out until the temps start dipping below 40. I just have to make sure I get them in before the 1st frost. Orchiata is all I use now for bark. BTW, do not rinse or soak. I mix Orchiata and perlite for my catts. Catts like a nice chunky, airy mix that drains well and they also like to dry out between waterings. Over potting will cause root rot due to the medium staying too wet. You need just enough room for 1-2 yrs new growth. I use the 2 finger method between the plant and pot. Making your own mixes is great I make my own as I could buy materials in bulk cheaper compared to the small bags of pre mix I could get at Lowes. The roots hanging out over the pot are called arial roots. Just mist them from time to time. I have thought about some grow lights for the winter months but the extra cost on my light bill keeps me from doing it. Keep us posted on how your orchids are doing. For all my friends who are "up north". I hope you all are warm. AZ in the Summer is like living in Hell with Temperatures to match and no place to grow orchids without a proper greenhouse, but in WINTER. While you all are FREEZING, here in Tucson it is a rather cold upper 60's in the day and a low of the lower 40's or upper 30's at night. Any who I hope you and your chids are all right. A few notes about Orchids and Potato Chips -- one is never enough. Went to the TOS auction and somehow walked away with 6 Cats for $37 -- 3 needed "good homes" so I picked them up cheap. I realized my Orchid Table is almost over flowing, so I gave 2 away as a birthday present to colleague the next night. Today I got in another one. I now have 13 Cats on the Orchid Table, though I suspect a few are probably not going to make it through the Winter (three don't look to be long for this world Summer sucked them almost dry -- one I might do an emergency transplant on to see if I can save it. There is some GOOD NEWS on the home front: The two Near Basket cases I transplanted last April, and then gave to a member of the TOS for some TLC in his proper greenhouse, told me both plants are doing quite well and might actually BLOOM sometime in the Spring when they will come home to join the other Cats. Onward. As I mentioned WINTER is HERE!!! The chids have to come in off the porch as 40 and 30 degree temperatures are not Cats, chids, and "kittens -- a small Cattleys?" I about to head down to Lowe's or Home Despot to see what I can find for orchid shelving, etc. I was reading something about growing orchids under lights and people were talking about "humidity" etc., Humidity is a BIG problem if you living in the DESERT South West -- we've got NONE so to speak!! They went on to talk about choosing a room (or space ) which can tolerate HUMIDITY. Whoops!!! I live in a RENTED 1 BR apt., with lot of Drywall. I *think* I have found a 4' section of wall in the Living Room / Dining Room that with a little -- OK a LOT -- of rearrangement will hold some Shelving -- henceforthwith to be known as the -- wait for it -- chids room. I up until this point I had not considered the consequences of bringing my Cats inside sitting them on HUMIDITY TRAYS and since the Cat's and "Kittens" are now large enough in numbers no doubt I have created a small micro-climate, and I can see GREEN SLIME growing along the Drywall where the chids are having a good ol' time. Not a great idea even if I owned the apt, and even worse idea since I don't. Any pragmatic suggestions for combating the unintended consequences of raising the humidity in the locale of a drywall wall. Any one?!? Any one at all??? "The roots hanging out over the pot are called arial roots. Just mist them from time to time. I have thought about some grow lights for the winter months but the extra cost on my light bill keeps me from doing it. Clean with a mild bleach or borax solution. Prime the wall with Kilz anti-mold/mildew primer and paint with high gloss enamel, so you can wipe the walls as necessary. Place a fan where strong air flow will dry the wall quickly after you mist your plants. Occasionally wipe the walls with borax solution, following directions on the box. If the drywall is so damaged that it needs to be replaced, use "greenwall" --- the type used in bathrooms for shower installations. I updated my growing area today. I keep Cattleyas, Phals and Brassia Rex. I have a misting system set up for the 20 long aquarium which helps with my lack of humidity in winter. I would be curious to know what kind of misting system do u have as I am in process of setting up a greenhouse. I have an exo terra monsoon mister. It's used mostly for terrariums. Can run up to six nozzles. I don't like it, should have scrapped a little more money together and got a mist King. I've had to exchange my monsoon under warranty twice in a year and a half. Here's an update to my set up, I noticed the last one was back in 2011 and there were a lot of spaces on the benches. Earlier this year, I culled a lot of under performing stock, so have made a bit of room for new stock. You'll notice I have a black bucket suspended from the ceiling, that is filled with orchid feed and drip feed a Coelogyne schilleriana and maryiana, both mounted on mesh tubes filled with sphag. The heater and Evap cooler are on timers, when one switches on, the other switches off, and the misters are also on timers, so the whole system is relatively automated. gingerhill and wintergirl like this. In looking at your GH I don't see any Shade cloth. Where are u that u can get away with that. Easy, just plugged up the nozzles pointing in that direction with BlueTack. The shadecloth is on the OUTSIDE, the inside has translucent Solaweave, that way I get the GH atmospherically controlled the way I want it. It is virtually a sealed unit, and the fresh air comes from the Evap cooler and goes out through the bottom half of the door which has a sheet of Solarweave on it as well, and I just roll it halfway up during the day, and the positive pressure forces bad air and heat out. If you go to my sticky on "How to build a GH" you'll see the whole construction from woe to go. Anton. Tks for your answer. You have some beautiful plants with some monster root systems. I should be putting mine together in about 3 weeks. I can't wait. I grew successfully under lights for 3 years and am now takjng that bjg step to have my own GH. Easy for nozzles I guess... I have misters up high though. Trying to come up with something to keep them from misting my fan. i might have to make some sort of awning for it. You just take off the nozzles at the end, and dismantle them as per image and put a tiny bit of bluetack inside. Here is my small safety ladder with 3 steps, and that gets me high enough to get to them, it also has a tray to enable you to put things on. Also, my ceiling is 9 feet high to just to give you some perspective on height. I use the tray to place the watering can on when I am feeding hanging plants. Last edited by Anton; 01-04-2015 at 07:31 PM. Mine is another 2 metres higher than what you can see as I have a false ceiling of thermal insulation material to keep my winter heating bills down and make it easier for the evap cooler to do its job, even though it is an industrial sized unit. OBVIOUSLY I didn't put the misters up there, although, I would have had a better coverage from them if I had. The issue comes from having to clean the scale out of them, a bit too high for my 3 step ladder. I have an area between the house and fence on the N to slightly N/W side. I have put some shelves on the fence and keep my orchids in that area, One part is 2.9m x 3m and then along the length of the fence and path about 4m. I am mostly growing cymbidiums, dendrobiums, with a few odd bits & Pieces like sarcochilus. masdevallia. I also grow Phalanopsis but keep them inside. My question is, I am going to put shade cloth over the 'square' area and am wondering which one I should get, 50% or 75%. I cannot put up photos I'm sorry because I do not know how to do that. I have been using 50% on my greenhouse. Still get plenty of light but have noticed it does keep it a little cooler and my plants haven't been so stressed. There is a paperclip in the margin just above the box your posting in. 1.Click on arrow and another window will pop up. 2. Click on choose file. Another window will pop up. Go to where you keep your pictures in your computer. 3. Choose photo and click on open. Too add more photos follow steps 2 & 3. 4. When done click on upload in the lower right corner. Right under the where you loaded your pictures you may see a % left loading or waiting on orchidgeeks. When either one of those is done click on close window in the upper right corner. 5. Go back up to the paper clip and click on the arrow. A window will open Manage attachments. Click on [ATTACH] and your photo will show up in this box as [ATTACH] but if you click on preview post you will be able to see your pictures. My winter growing space. Temp stays about 70 F,down near the floor is a lot cooler 55-65 F and humidity about 50%. Lights are T5's, T8, 100watt CFL (6500K). 16 inch osculating fan and a warm mist humidifier. 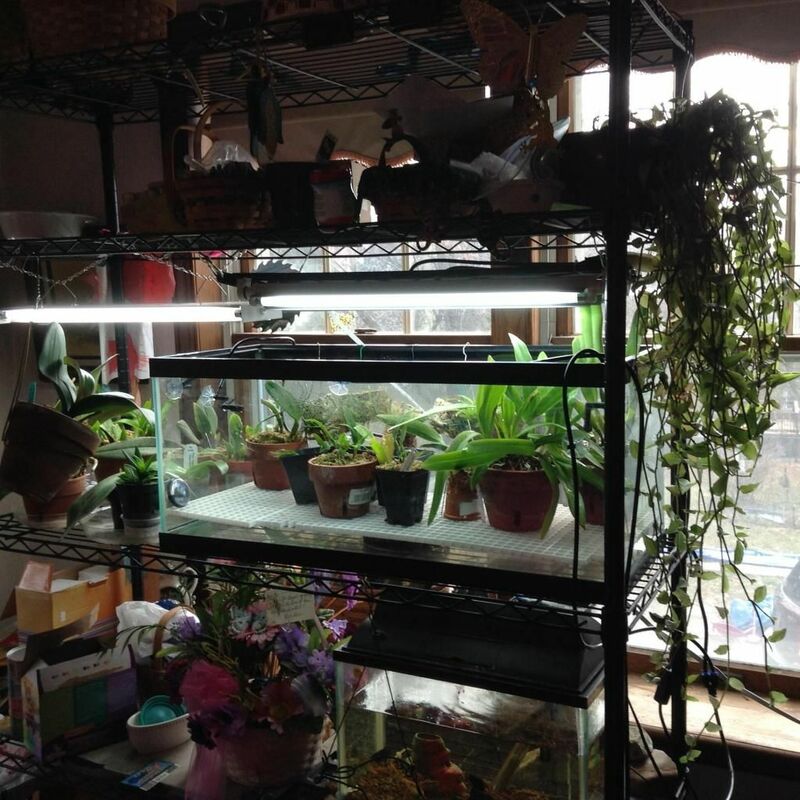 My cattleya,laelias and other bright light orchids are much happier w/this setup where there not all crammed into one window competing for what few hours of afternoon sun I get during the winter months. This making the watering/care so much easier. Btw, don't pay any attention to the mess. This used to be a bedroom back in the day but now is my orchid room in the winter which is Oct-May, storage and a pantry.